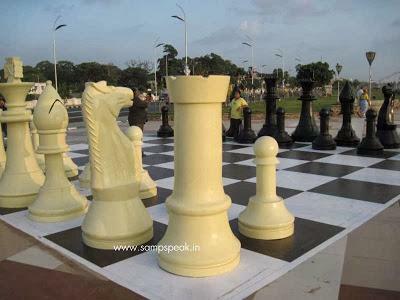 Chennai is abuzz with activity garnering International attention….. the metro rail was inaugurated by Tamilnadu CM Ms J Jayalalithaa ~ and there was more activity to be seen in the Sports front too………….. the multitude of journalists and chess fans went towards the Nehru Indoor Stadium.~ that was the venue of the beautiful opening ceremony with highest attendance in chess history. It is all happening in Chennai now as reigning champion Viswanathan Anand (43) faces off 22-year-old upstart Magnus Carlsen of Norway—nicknamed the "Mozart of Chess" because of his meteoric rise at such a young age. The FIDE World Chess Championship Match ( FWCM) is the final event of the World Championship cycle. The two participants are World Champion V. Anand (India) and his challenger GM Magnus Carlsen who qualified from the Candidates Tournament 2013. The winner of the FWCM 2013 will be declared World Champion for the period 2013-2014. The brightest star in the horizon for Indians appeared and it was ‘Vishy’ Viswanathan Anand ~ who has won the World Chess Championship five times (2000, 2007, 2008, 2010, 2012), and has been the undisputed World Champion since 2007. Anand was the FIDE World Rapid Chess Champion in 2003, and is widely considered the strongest rapid player of his generation. The 2013 FIDE World Chess Championship matches will take place 07-26 November in Chennai. Hyatt Regency Chennai, the newly sprung 5 star luxury hotel right on the Mount road is the venue of the match. 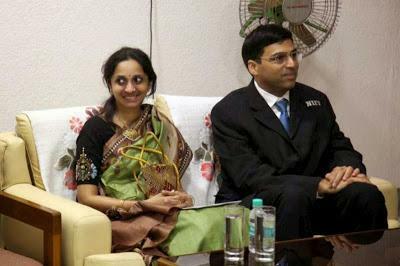 Viswanathan Anand (India) retained the title of the World Champion after defeating the challenger Boris Gelfand (Israel) in the FIDE World Chess Championship Match in 2012 in Moscow, Russia. The match was held on 10-31st May, 2012, at the Engineering Building of the State Tretyakov Gallery. With equal score in the classical games (1 win for each and 10 draws) the match outcome was decided in a rapid tiebreak. Anand won one rapid game and drew the remaining three to defend the title he holds from Mexico 2007, Bonn 2008, and Sofia 2010. Anand was also World Champion in 2000 after the knock-out tournament and he won the FIDE World Rapid Championship in 2003. Magnus Carlsen won the Candidates Tournament 2013 after the thrilling finish to become the official challenger of reigning World Champion Viswanathan Anand. In the last round of the event both Carlsen and the other leader, Vladimir Kramnik, unexpectedly lost their games and remained tied on the first place with 8,5 points each. Carlsen won on the second tiebreak rule – higher number of wins – to qualify for the World Championship Match. The FIDE Candidates’ Tournament took place at IET London, Savoy Place. It was sponsored by the State Oil Company of Azerbaijan Republic (SOCAR) and organized by AGON and the World Chess Federation (FIDE). The Western media as usual is creating a hype trying to place Carlsen as firm favorite before the match. According to British betting house Ladbrokes, Carlsen is the odds-on heavy favorite. Hedge fund manager Boaz Weinstein of Saba Capital, who gained renown for being on the other (winning) side of theJPMorgan"London Whale" trade, told CNBC that he thinks "Magnus Carlsen will win handily, despite Anand's home-field advantage." But Rogoff isn't convinced of Carlsen's invicibility. "He's not nearly the prohibitive favorite that many of his followers think. He doesn't have the experience of playing these matches. Anand has seen it all. It's always hard for the person who's trying to win the first time. It's much easier for the person trying to win the fifth or sixth time." Now the news is that defending champion Viswanathan Anand will start his campaign with black pieces in the first game of the 12-round World Chess Championship on Saturday. 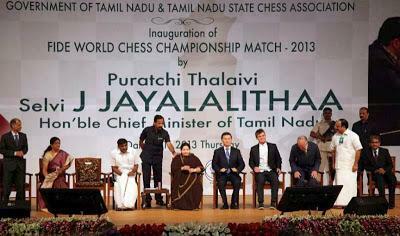 After declaring the ‘FIDE World Championship Match-2013′ open, Tamil Nadu chief minister J Jayalalithaa picked the photograph of Anand from the first bowl and a Black piece from the other during the draw of lots for the match to be held at Hyatt Regency hotel. Instantly, it brought loud cheers from the almost packed Jawaharlal Nehru Indoor Stadium, with the spectators wishing Anand the very best. Anand will get back-to-back white games in round six and seven when the changing over would be done. As per rules, the player getting white in game one has to get black in game seven to make it even for both participants. In the opening ceremony in Chennai, seven budding state chess players escorted Anand and Carlsen to the dais and the two contestants exchanged pleasantries with the chief minister. Both Anand and Carlsen got huge cheers from the crowd. Jayalalithaa hailed Anand as the greatest sportsman India has ever produced and Carlsen as ‘Mozart of Chess’ whose precocious talent has captured the imagination of chess lovers across the world. Jayalalithaa described Anand as the epitome of chess in India and a role model for aspiring chess players of the country. “This astoundingly modest personality from Chennai has made us all proud with his resplendent ability to deftly navigate expertly around this complex maze of 64 squares,” she said. Talking about Anand’s love and hunger for mastering his craft, Jayalalithaa said “consistency, versatility and single-minded focus have always been Anand’s forte”.